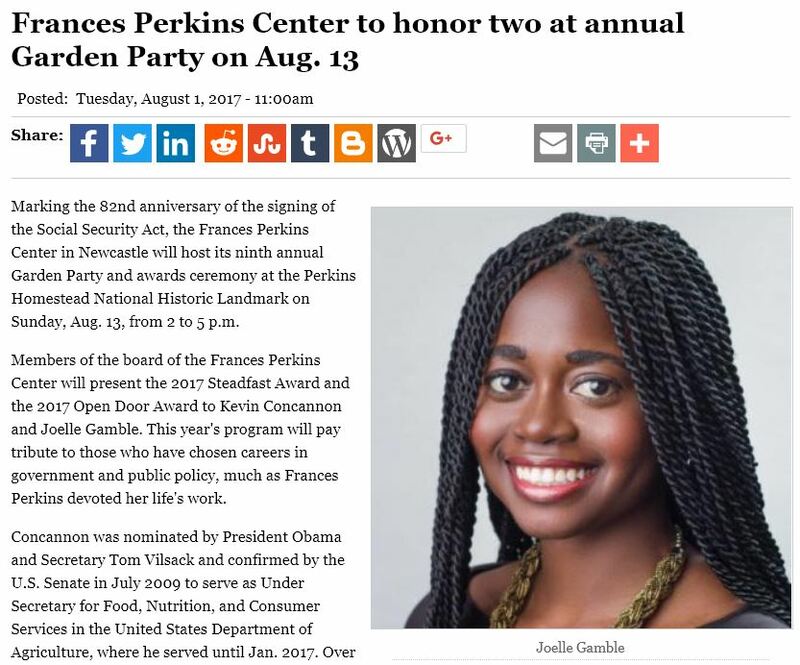 Marking the 82nd anniversary of the signing of the Social Security Act, the Frances Perkins Center in Newcastle will host its ninth annual Garden Party and awards ceremony at the Perkins Homestead National Historic Landmark on Sunday, Aug. 13, from 2 to 5 p.m.
Members of the board of the Frances Perkins Center will present the 2017 Steadfast Award and the 2017 Open Door Award to Kevin Concannon and Joelle Gamble. This year’s program will pay tribute to those who have chosen careers in government and public policy, much as Frances Perkins devoted her life’s work. Concannon was nominated by President Obama and Secretary Tom Vilsack and confirmed by the U.S. Senate in July 2009 to serve as Under Secretary for Food, Nutrition, and Consumer Services in the United States Department of Agriculture, where he served until Jan. 2017. Over the past 25 years, he has served as Commissioner of State Health and Human Services departments in Maine, Oregon, and Iowa. He has led Food, Nutrition, and Consumer Services during the deepest economic recession in 70 years while promoting better access to anti-hunger programs. Gamble is transitioning from her role as senior advisor to the president & CEO of the Roosevelt Institute to graduate school. Under Gamble’s leadership, Roosevelt Institute increased its ability to influence local and state government around our generation’s policy priorities. Because who writes the rules matters, she has also prioritized increasing the racial, socioeconomic and gender diversity of its national student leadership — with chapters at both four-year institutions and community colleges and people of color representing the majority or our membership leadership roles. Gamble also writes on topics of race and economics. She has been featured in Fox Business, The Nation, Salon, The Hill, The Huffington Post and NextCity. Fusion named her one of 30 women under 30 who are influenced the 2016 election. Tickets: Starting at $75 per person, with proceeds to benefit the Frances Perkins Center. Guests will be shuttled from Newcastle via old-fashioned trolley to the Perkins Homestead, where wine, refreshments and a light hors d’oeuvres buffet will be served amidst the beautiful gardens of the Brick House, with all proceeds directly supporting the educational mission of the Frances Perkins Center. Frances Perkins, the first woman to serve in a U.S. Cabinet as the Secretary of Labor under Franklin Delano Roosevelt, is credited as one of the principal architects of the New Deal. Each year, the Frances Perkins Center celebrates her enduring impact on American labor and recognizes those who model Perkins’ barrier-breaking legacy in their everyday lives. Tickets may be purchased online at www.brownpapertickets.com, by phone at (207) 563-3374, or in-person at 170A Main Street in Damariscotta. For more information, please visit www.francesperkinscenter.org or contact info@francesperkinscenter.org.